is getting to know some of the local businesses of an area. In fact, Dave and I both always make it a priority to bring back at least one locally-made product for our home or kitchen as a souvenir from wherever we’ve traveled to. Not only does it feel more unique, we also love being able to support a community and “give back” to said community as kind of our way of saying thank you for our time spent there. However, one of the perks of my job, is that sometimes these local brands reach out and connect with me first. Which is just what happened with Portland, Maine based brand, Evangeline Linens. I was instantly captivated by their beautiful imagery, branding and textiles, and, of course, that it was a local artisanal brand. In other words, this is exactly the kind of “souvenir” we would happily hand over all our money for. The timing of them reaching out couldn’t have been more perfect, either, with our recent travels to Maine, our new Local Love feature (meant to highlight local businesses and creatives in the places we’ve traveled to), and, last but not least, being in major need of a new bedspread for our bedroom, which is currently undergoing a long over-due and desperately needed makeover (aka you’ll be seeing a lot more of this woven in Maine, 100% cotton pinstripe blanket soon). Maine is such a magically, wildly beautiful and inspiring state, with rugged coastlines, tall trees, mossy greens, and deep blue seas, and I love that it is that exact magic and beauty that is woven into every piece at Evangeline. While the blankets are soft and warm all on their own, you can feel that extra special cozy Maine factor envelope you every time you wrap yourself up in one of their blankets. 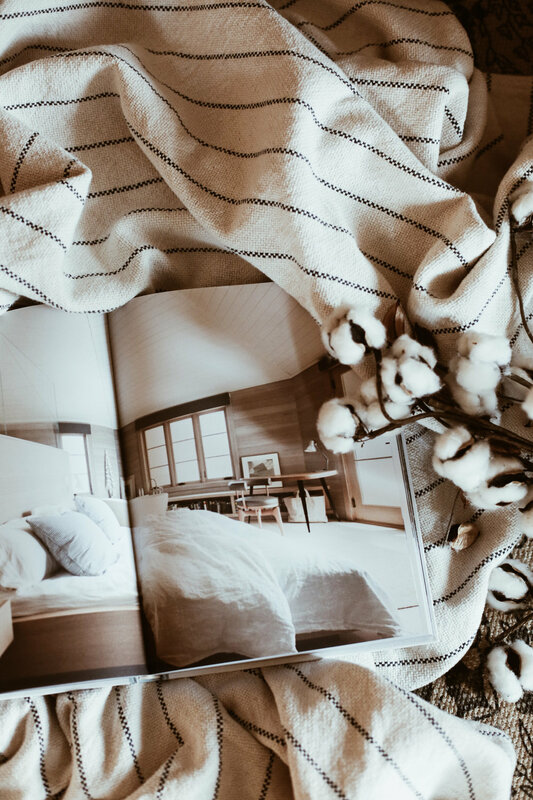 That exact coziness is something I crave out here on the West Coast, so, of course, I couldn’t think of a more perfect piece than the pinstripe blanket to complete our bedroom space and ensure only the coziest vibes as I drift off every night into a dreamy Maine escape. THIS is the forest primeval. green, indistinct in the twilight.